The following datasets will be used for this task. Synthetic training set: This set is constructed in the following two steps and will be used for estimation/training purposes. i) 84,000 275 pixel x 400 pixel ground-truth fingerprint images without any noise or scratches, but with random transformations (at most five pixels translation and +/-10 degrees rotation) were generated by using the software Anguli: Synthetic Fingerprint Generator. 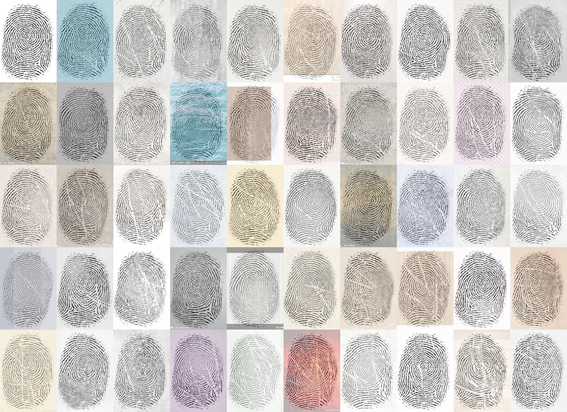 ii) 84,000 275 pixel x 400 pixel degraded fingerprint images were generated by applying random artifacts (blur, brightness, contrast, elastic transformation, occlusion, scratch, resolution, rotation) and backgrounds to the ground-truth fingerprint images. In total, it contains 168,000 fingerprint images (84,000 fingerprints, and two impressions - one ground-truth and one degraded - per fingerprint). Synthetic test set: This set is constructed similarly to the synthetic training set and will be used to evaluate the reconstruction performance. In total, it contains 16,800 fingerprint images (8,400 fingerprints and two impressions - one ground-truth and one degraded - per fingerprint). Since this set will be used for the purpose of evaluating the reconstruction performance, only the degraded and not the ground-truth fingerprint images will be provided to participants. Real test set: This set is constructed by systematically drawing fingerprint images with varying sizes from publicly available datasets. In total, it contains 1680 fingerprint images (140 fingerprints and 12 impressions - high-quality scans under operational conditions - per fingerprint). In addition to these training and test sets, two validation sets with the same properties as their test counterparts except for the total number of fingerprint images (which will be reduced by a factor of ~10) will be provided. The following figure shows examples from the synthetic datasets (the first image is the ground-truth image and the rest are randomly degraded images). Training data is available in following links.